Sun holidays to the Costa del Azahar? : Peninsula (the Gibraltar of Valencia) in the north of the province with a castle on the rocks on the Costa del Azahar. : Capital of Castellon at the Costa del Azahar. Monumental buildings around Plaza Mayor. 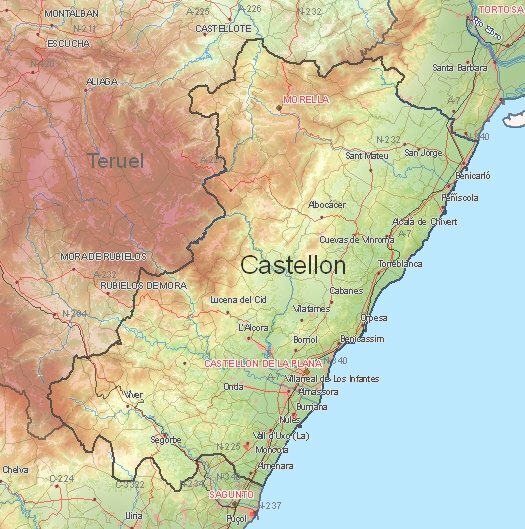 : Town in the interior and the north of the province of Castellon. The town is completely surrounded by old medieval city walls with six city gates. On a cliff top a ruin overlooks the center of the town. : Town with the ruins of a Muslim castle 25 kilometres north of Castellón. The town of red sandstone has a modern art museum (including Miró). : Natural History Museum (Museo de ciencias naturales El Carmen). Other attractions in the ceramics town 20 kilometres from the coast are the Moorish ruins with museum. : Not far from Benicasim just behind the coast, this walking and cycling area has a beautiful old monastery and a new convent. The highest mountain in the area is the 729 meters Bartolo. There is also a botanical garden. : Islands 56 km off the coast of Castellón consisting of the islands Illa Grossa (Columbrete Grande), La Fora Dada, La Ferrera and El Carallot. The total size is only 19 hectares, the islands are of volcanic origin. The fauna includes the Eleonora's Falcon and Audouin's Gull. At the largest island a lighthouse can be seen. 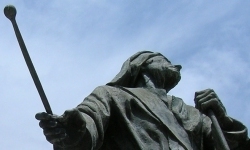 Soon Castellón de la Plana webcam, blogs, travelreports, spanish recipes and movie locations. 1) Current weather in Castellon (temperature, precipitation).